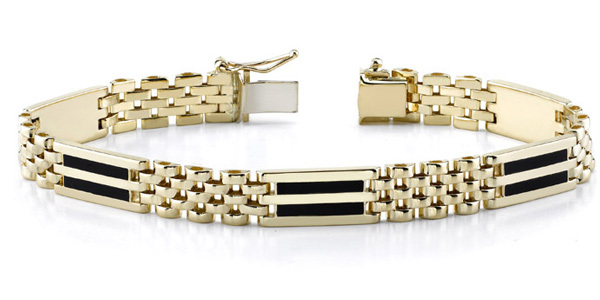 High quality, men's onyx design bracelet with two rows of onyx set in 14K Solid Gold. Bracelet measures 9mm wide (3/8"). 8 1/4 Inches in length (available in custom sizes by special order). Guaranteed 14K Solid Gold and genuine black onyx. 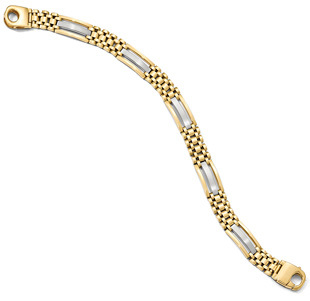 We guarantee our 14K Gold Men's Two-Row Onyx Bracelet to be high quality, authentic jewelry, as described above.